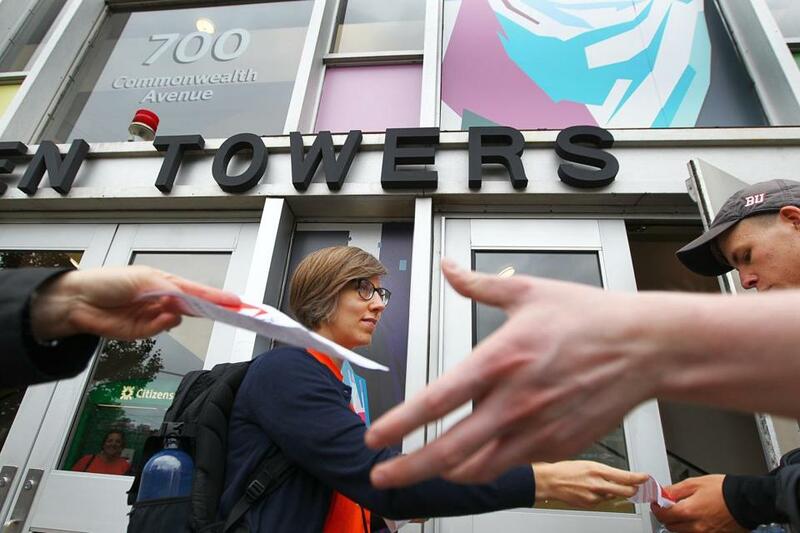 Boston University lecturer Jessica Kent joined colleagues handing out fliers during an informational picket outside a Commonwealth Avenue dormitory on Sunday. A storm is brewing at Boston University between lecturers — a little-known class of full-time faculty — and the administration over what lecturers say is shamefully low pay and unfair working conditions. Lecturers teach courses, publish papers, serve on committees, and mentor students, but they are paid less than half the salary of full professors, wages that hardly cover the cost of living in a city like Boston. They make ends meet by working second jobs, doing research in their free time, and depending on extended family for child care. Last April, about 250 lecturers unionized with the Service Employees International Union Local 509 to demand higher wages and more transparent working conditions, and negotiations have become tense. Over the weekend, lecturers held banners and distributed fliers outside dormitories in an attempt to tell parents and students that the price those families pay — $67,000 per year for tuition plus room and board — is more than many lecturers’ annual salary. “Pay me what I deserve so I can focus on this really important job that BU wants me to do,” said Seth Blumenthal, 43, a lecturer in the undergraduate writing program who has a PhD from BU, a master’s degree from University of Massachusetts Boston, and an undergraduate degree from Colby College. He earns about $52,000 per year. Lecturers said low pay and a high teaching load make it difficult for them to devote themselves to their students or do research to improve their academic standing. Blumenthal works two nights per week at a restaurant, money that helps him afford the more than $400 per month he pays toward his student loans. He is writing a book, but edits often have to wait until summer. He could look for a tenure track job elsewhere in the country, but he and his wife depend on their parents to help with their two young children, one of whom has autism. “Because we are so strapped, it’s really hard to do this one thing really well,” he said. The average salary of a BU lecturer was $66,000 in 2015, the latest data available from the Chronicle of Higher Education, which tracks such rates at many colleges. That rate rose from $50,000 in 2005. The average salary of a professor grew at a faster rate, data show, from $117,000 to $169,000 over the same time period. Lecturers are different from adjuncts, a group of part-time faculty paid on a per-course basis. Adjuncts at BU voted to unionize in 2015 and are also represented by SEIU Local 509. Lecturers are full-time teaching staff with contracts and health insurance, but they are not on the hiring track that would eventually grant them tenure, which means a job guaranteed for life except under extreme circumstances. The lecturers typically teach three or four courses per semester, while tenured faculty teach one or two, and they are not granted sabbaticals or other time to do research or publish, as tenure-track faculty are. Still, lecturers said, they feel pressure to publish, an unofficial requirement for promotion. Jessica Bozek, a senior lecturer in the writing program, said she presented a paper at a conference in Detroit, but because BU’s funding didn’t cover the entire cost of the trip, she had to pay about $400 of her own money. Bozek said she once heard BU students chatting in the hall about how they hoped to make a starting salary of $60,000 after graduation. “I thought: I am 10 years into my career and I’m not even touching that and I have graduate degrees and experience,” said Bozek, the author of two books of poetry. Contract negotiations between BU and SEIU Local 509 have lasted nearly a year. Associate Provost Julie Sandell, who is bargaining with the lecturer union, said she believes the lecturers are paid competitively for that position in Boston. Other universities, including Northeastern, have lecturers who were paid an average of $59,000 in 2015, according to the Chronicle. “We are a large school, we have lots of faculty, this is one component of our faculty, and we have to balance lots of competing concerns when we do our budget,” said Sandell, who is associate provost for faculty affairs. Programs like the undergraduate writing program rely almost entirely on lecturers, Sandell said. In other parts of the university, they might teach upper-level students, she said. The lecturers in the union are from the colleges of arts and sciences, general studies, social work, fine arts, communications, continuing education, theology, and education, according to the union. Engineering and business lecturers are not part of the union. In February, the union filed a complaint with the National Labor Relations Board that alleged the school was not being transparent in negotiations with lecturers by withholding data about professors’ salaries and workload. That board last week issued a notice that BU must respond to the union’s complaint about not providing the information. It also scheduled a hearing for January 2018 in the event BU does not respond. Over the weekend the lecturers fanned out around BU’s campus to pass out water bottles to students as they moved in. Inside the bottle was a flier that explained their situation and unionizing efforts. On Sunday morning, five lecturers stood outside Warren Towers, a freshman dormitory on Commonwealth Avenue, in orange shirts. Most people rushing in and out of the dorm took a flier but didn’t stop to talk. Those who did seemed unaware of the situation. The BU president, Robert A. Brown, makes $1.5 million, according to the most recently available data. Tom Horner, who was at BU with his wife, Jan, dropping off their granddaughter, Mina, said that he has not heard about lecturers unionizing but is familiar with similar efforts by adjuncts in their home state, Minnesota, and that he doesn’t like the sound of it. “I’m a little bit skeptical of all unions,” Horner said. Despite their working conditions, many lecturers said they love their jobs and feel lucky to teach at BU. Blumenthal finds himself teaching his freshmen not only writing, but basic college survival skills. He comforts them when the inevitable first-semester stress brings tears. One night he stayed up late to help edit the cover letter for a student who was applying to Harvard Medical School. Lecturers are not technically allowed to be students’ academic advisers, but many do de facto advising anyway. “I think we all love our students, really,” he said.